The Danao Association USA (DAUSA) medical-surgical-dental-scholarship mission has become not only a yearly commitment of the association since 1998 but also one of the highlights of the fiesta celebration of Danao City, Cebu every September, in honor of St. Thomas de Villanueva, the patron saint who was known for his generosity in giving alms to the poorest of the poor. The sources of medications, medical supplies & monetary assistance for the DAUSA medical mission include charitable donors like the AmeriCares, Medical Assistance Program International (MAP), Inter-church Medical Assistance (IMA), Catholic Medical Mission Board (CMMB), individual sponsors & pharmaceuticals. Every September since 1998 is a much awaited month for the DAUSA members because it’s the time to “Balik-Danao” or return-to-hometown Danao City. They are named the “Balikbayans”. They don’t only visit & enjoy the fiesta-celebration, but also extend blessings to deserving underprivileged fellow-Danawanons through the medical-dental-surgical mission & scholarship program. The nostalgic ‘Balikbayans’ or those who return-to-hometown, & the DAUSA medical mission team experienced once again the warm hospitality, entertainment, & enjoyable participation in the traditional welcome luncheon at the residence of Mayor Boy & Tita Durano, lunch with the scholars, the Balik-Danao Night, the mission-break lunch in the farm of Sany & Tita Barriga Tomayao, the Fiesta Parade & Culmination Night. The Balikbayans were also invited to other special events like Search of the ‘Matron of Danao’, Karanza competition & search for ‘Karanza Queen’, Photo Contest, individual Barangay celebration & procession & of course sumptuous luncheons & dinners. Before the medical mission, a meeting of representatives of the mission volunteers, local & from abroad was called. Danao City Councilor Dr. Cynthia Duterte, previous Chief of Danao General Hospital presided the pre-mission meeting, attended by the DAUSA Medical Mission Team & the chairpersons of the different committees that the Danao City Government organized for the mission. The DAUSA team was represented by Cecilia Barriga Ford, incumbent DAUSA president, Crosine Roble, head of the dental mission, Nanay Marrieta Palos, preceding DAUSA president, Noemi Laurente Sigrist from Switzerland & outgoing Balik-Danao queen, & Dr. Anita Cal Jackson, Chief of Medical Mission. There was a good interaction between the “Balikbayan” team & the hosting Danao City government representatives. The family members of Noemi Sigrist & Ricky Mata helped in sorting & labeling the medications, & grouped them according to their indications. Afterwards, the organized boxes of medications were kept in a locked room. Early Wednesday morning on the first day of the medical mission, the boxes were transported to the civic center. After the first day of the mission, the boxes of remaining meds were transported safely to the house of Genis Cabahug, brother of past DAUSA president Gemma Montegrande. Genis’ wife Zorina Cabahug served as the licensed Chief Pharmacist of the mission. There was more than sufficient supply of medications for the 2nd day of the medical mission. The free consultation & dispensing of prescriptions at the pharmacy went smoothly at the air-conditioned civic center. The physicians from the Danao City Health Center & Dental office offered their free services in consultation & prescription, & tooth-extraction. Knowledgeable registered nurses were assigned in the pharmacy. Since the operating room of the hospital was temporarily closed due to its renovation & expansion to become the Provincial Hospital of Cebu, only minor surgeries could be performed in the emergency room. Surgeons from Cebu City & their resident physicians offered free surgical services. 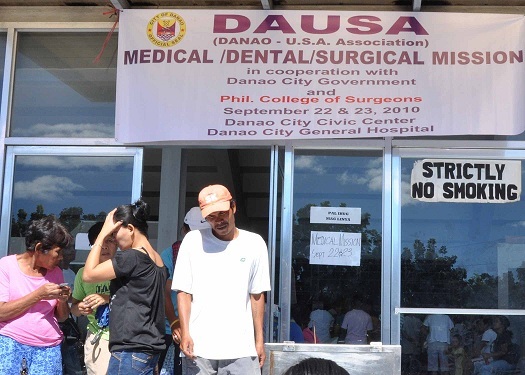 Since there were extra medications, an impromptu medical mission was extended to a barrio of Danao, Santa Rosa. It was a noble idea of the DAUSA president Cecilia Ford. It was managed by three people, Cecilia & her sister & Dr. Jackson. The barrio Capitan sent a messenger house-to-house. Patients of different ages, newborn, children, teenagers, adults & seniors came with various problems. Registration & traffic were well-controlled; & consultation, examination, prescription & instruction were accomplished for every patient, one at a time, & in one setting.